Team MJV is a full-service provider of commercial cleaning service with an unmatched commitment to quality, service, and value. Enhance your company’s image to internal customers. Provide a clean and safe working environment for your clients, tenants, or employees. Provide you with information on preventitive maintenance that can help you control facility maintenance and long-term cleaning costs. In addition, our in–house training department assures you that all of the people working in your facility will be thoroughly trained about the process required to most effectively maintain your facility. Here are just a few of the businesses we serve and programs we provide. Team MJV is a full service provider of commercial cleaning service with an unmatched commitment to quality, service and value. How does Daylight Cleaning work? Team MJV is a full service provider of commercial cleaning service with an unmatched commitment to quality, service and value. We take great pride in providing our customers with the best hard floor service available. 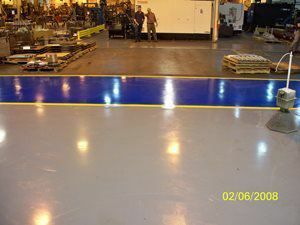 Knowing what chemicals and procedures to use on hard floors is critical to how well your floors look after the job is completed. With the many types of floors used in buildings today, you need someone you can trust by providing the right advice and expert floor care. We service a variety of different type floors and our service techs have ongoing training to make them the best in the business. Let Team MJV be your service provider and be proud of your floors! The appearance of your facilities reflects on your company's image. Your customers and employees expect and deserve a clean, attractive and safe environment. Team MJV provides sweeping, power washing and trash removal services that maintain your site and improve the look of your premises. • Well maintained parking areas and sidewalks are a key to attracting customers. Cleanliness ranks as one of the top factors in determining where people shop. Exterior cleanliness is as important as interior cleanliness. • Sweeping your parking area on a regular basis can help to minimize pollutants in your storm water stream, which also could create municipal or state penalties or citations. • When dirt is allowed to stay on pavement, it quickly starts deteriorating the paving material. Replacement costs for pavement far exceed the routine expense of sweeping. • Contracting with MJV Power Sweeping is the most efficient way to keep your parking area or lot clean and debris free. Contact us today. Our buyer's source quality products from nationally branded manufacturers that improve your facilities image, reduce operating cost and are friendly to the environment. But most important they are safe for end users with the health and well being of building occupants in mind. Our Regional Operations Coaches and Account Executives are fully trained in each area to provide direction on which products will complete needed tasks. We distribute several valued manufacturers including Diversey, Rubbermaid, GOJO, Kimberly-Clark, Windsor Industries, Spartan Chemical, Osram Sylvania, Bay West, Andersen Mat, Claire Manufacturing, Pitt Plastics, 3M, Georgia Pacific, Sunburst Chemical, Cascade Paper, Nilfisk-Advance, Carlisle and Ecolab. Team MJV offers carpet, upholstery and partition cleaning for any business. Our technicians are fully trained on using the right chemicals and procedures to get the best results. We provide emergency 24/7 cleaning. Team MJV can provide two types of cleaning that will extend the life of your carpets. Interim carpet cleaning is the cleaning that takes place between the daily carpet vacuuming and the deep wet extraction cleaning. TWe use an encapsulation method that is low moisture used with cylindrical brushes to help agitate and loosen and surrounds the soil and then dries to a non-sticky crystal so it can be vacuumed. The drying process is under 30 minutes making it easy to do more frequently. The results are quick and easy making your carpets clean and smell fresh! Team MJV also uses carpet extractors that have the pressure and power to reach deep into the carpet fibers and dissolve and remove soils. No other method is as effective. We can evaluate your facility and make recommendations on how to extend the life of your carpet with daily vacuuming, floor mat placement, chair mats, spot cleaning and a carpet cleaning schedule that meets your needs based on soil load and traffic. Let one of our experts visit your facility for a free analysis on the best approach to maintaining carpets in your facility. When you need your carpets cleaned, call Team MJV! Team MJV is your Matting expert. Our trained team can help to analyze your facility to maximize your need for matting. Catching and trapping the soil, water and dirt at the door helps to keep your facility looking great. Choosing the right combination of mats for both inside and outside the building provides a safe, effective and attractive surface. These are the features of high performance matting products. On average, purchasing your mats vs renting them will pay for themselves in less than 3 months. This is a great way to extend the life of your facility and help to make it look its best at all times. Varieties of sizes, colors and types are all option as well. Custom logo mats are available as well. Let us be the source for all your matting needs. Get the best possible use of the mat, and maintain its appearance and usefulness over the longest possible time. 70% to 80% of floor-damaging soil is tracked in from daily traffic through building entrances. Tracked-in dirt damages all types of flooring-carpet, tile, wood-and creates dust. 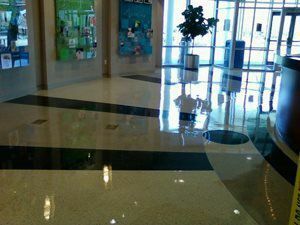 Unprotected entrance flooring can accumulate up to two pounds of dirt per square yard; even more in inclement weather. It can cost, at a minimum, $750 to remove one pound of dirt from a facility. Dirty, wet, and slippery floors are hazardous and present a poor image for a building and its occupants. Using high-performance mats will stop soil and water from entering your building. Contain soil and water for removal at a convenient time. Minimize tracking of contained soil and water into the building. Mats should have a dual-level construction that will store soil and water below shoe level. Provide a safe surface for traffic that is free of potential slip/fall accidents. Powerfully spray dirt and grime away. The Kaivac Cleaning System sprays at 500 PSI and will blast away the most stubborn grease and grime. Vacuum away bacteria and disease. The Kaivac Cleaning System vacuums the floor dry, completely removing soils, bacteria and other bio-hazardous contaminants. Experience sparkling and odorless bathrooms. The Kaivac Cleaning System eliminates the number one building maintenance complaint that restrooms are filthy and unsanitary. The Kaivac Cleaning System is 60 times more efficient in removing bacteria from grout lines than mopping, which is more likely to spread contamination then removing it. supplies Team MJV the means to perform onsite inspections, create immediate work orders, audit accounts and provide reporting to our customers. Customers also have QR code or website access to submit ‘in the moment’ feedback that submits directly to our Site Coach and Regional Coordinator for immediate attention.